Today we spent the entire day visiting nurseries and plant sales in the Bay Area but nowhere near Alameda. This was semi-impromptu, as we had planned to be in San Luis Obispo this weekend, but then we found out about a plant sale and that was the end of that. 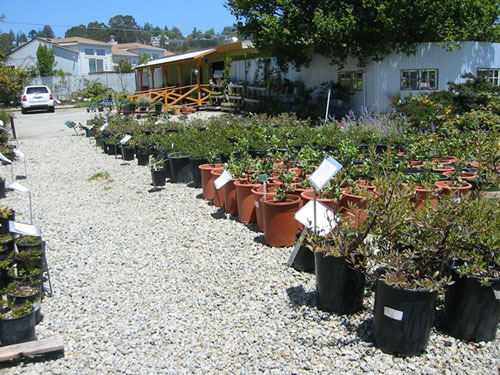 The plant sale was at Cabrillo College, which is in Aptos (South of Santa Cruz). It's also tomorrow if this inspires you. We had my list of wanted plants plus a list of requests from a friend, so we ended up with quite the haul. 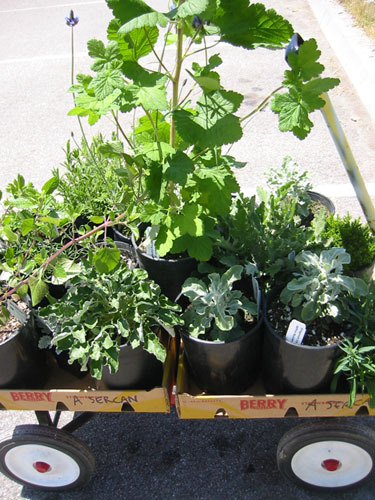 I was more reserved than I might have been because I really do prefer to plant things when they are smaller and most of the plant sale items were in gallon containers. Also, while the place was absolutely packed with plants they just happened to be out of the three things I absolutely wanted. Not that that kept me from filling up two and a half flats with pots. It is true that only about half of these are mine. But we filled the entire trunk of my car with plants. 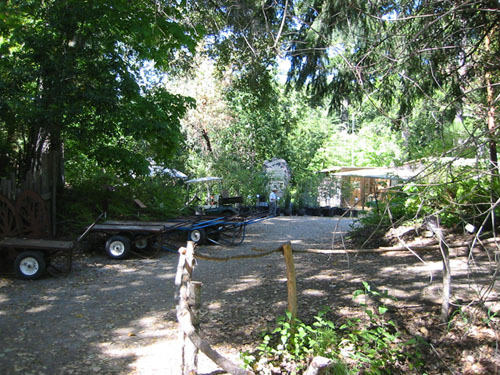 Our next stop was a few blocks down the road at Native Revival, a native plants nursery. It was everything I wanted Las Pilitas to be, and oddly enough, the nursery stock they had from Las Pilitas was far and away better than what we saw there. They had some stuff from Annie's, too, but I go there often enough that I try not to buy their plants elsewhere, too. If you live near Aptos, this place is definitely worth a visit for natives. I bought a Salvia clevelandii 'Pozo Blue' -- a Las Pilitas product and predictably in a pot with a sticker for a different plant on it, but fortunately without weeds -- that I have wanted since I saw one at Cal Poly. I am very partial to neat, well-labelled nurseries. 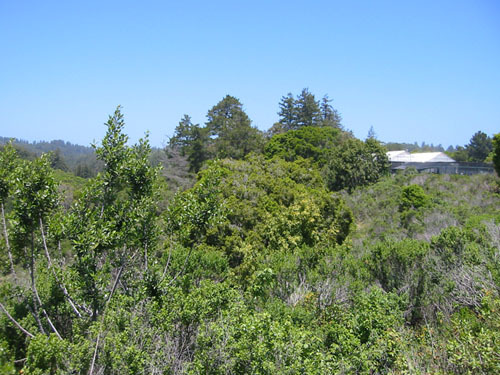 Then we drove up the coast along Route 1, which is very flat and gentle between Santa Cruz and San Francisco, up to Woodside, where we stopped in at Yerba Buena Nursery. Which was wonderful, too. Yerba Buena has a really terrific selection of manzanita and ceanothus, and of course the usual suspects in native plants. They have a lovely demonstration garden, too, which can help you see what mature plants will look like and how to create natural California settings. Don't go tomorrow -- they're having some kind of blowout tea for Mother's Day and it is predicted to be a madhouse -- but it's worth a trip if you want some inspiration. If you're looking for something specific, their plant list is online and if you call them they will hold plants for you for a week. I was finally able to get my Archystaphylos regismontana (King's Mountain Manzanita) that I have been hunting for with no success for almost a year, so I am in a very good mood tonight.